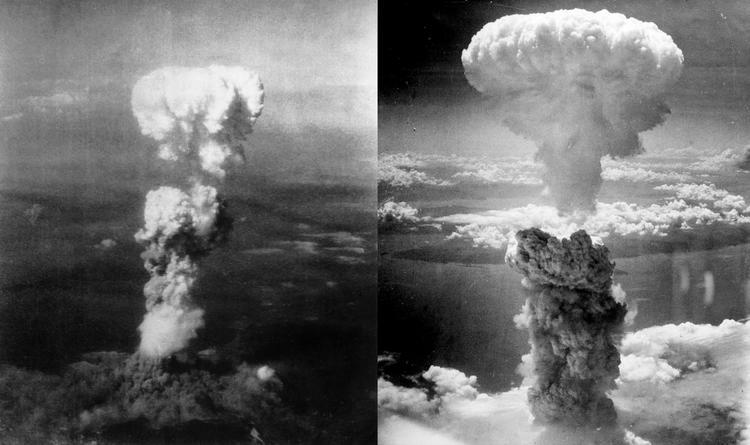 Hiroshima and Nagasaki: the single greatest acts of terrorism in human history? Surely 70 years is long enough for us to put to rest the tired canard of the atomic bombings on Japan being “the lesser of the two evils”, and recognise the true gravity of this crime against humanity. Seventy years ago today, the Unites States dropped the atomic bomb “Little Boy” on the Japanese city of Hiroshima. Three days later, a second nuclear weapon, “Fat man”, was dropped over Nagasaki. To date, these are the only nuclear attacks in the history of human warfare. The devastation caused by this new weapon was terrifying. The shockwave instantaneously obliterated almost everything within the blast radius. Houses, buildings and trees were levelled to the ground, as if they had been constructed of mere paper. The toll on the cities’ hapless inhabitants was even more dreadful, with the bombs claiming as many as 250,000 lives – the overwhelming majority civilian. Around half the number died on the day of the bombings. The intense heat and pressure of the nuclear reaction wrought unspeakable horror on the soft bodies of the victims in its path – their blood rapidly boiling inside them, before leaving them as dried husks that crumbled to ash. Shadows of people were etched onto walls and pavements, eerily marking the spot they had been standing only moments before incineration. Subsequent pressure waves squeezed the survivors until their internal organs ruptured inside them. Those who survived the initial explosion succumbed to their dreadful injuries over the following days, or developed strange new illnesses from radiation exposure in the bomb’s aftermath. It is difficult to survey the carnage and devastation, even in the cold light of day 70 years later, and not be appalled at this flagrant crime against humanity. The key justifications for the bombings still rest on the fallacy that they were necessary to end the war in the Pacific, representing the lesser of the evils. Apologists for the bombs claim the only alternative would have involved a protracted ground offensive that would have proved too costly for the Allies. The somewhat racialised argument goes that the Japanese adhered to a “bushido” warrior ethic of sacrifice, considered surrender to be dishonourable, and were committed to the notion of “total war”, in which every man, woman and child would be mobilised for war, armed with rudimentary bamboo spears if need be. In other words, the Japanese, having rejected all opportunities to surrender, had vowed to fight to the bitter end. Consequently the planned invasion of Japan, Operation Downfall, would have resulted in much higher casualty figures. The US anticipated losing up to 1m US soldiers during the invasion, alongside another 10m Japanese deaths. However, none of this cold calculation detracts from the fact that the bombings were indisputably heinous acts of state terrorism, fitting the standard definition almost perfectly: the use or threat of violence against civilians, to instil fear and achieve a political goal. Indeed, the Secret Target Committee in Los Alamos proposed that the large population centres of Kyoto or Hiroshima should be deliberately targeted for the “greatest psychological effect,” and to ensure the bombs’ “initial use was sufficiently spectacular for the importance of the weapon to be internationally recognised”. Incidentally, this curious phrasing also points to the true targets of the bombs – the Soviet Union. This atomic diplomacy was effectively a display of strength and a warning to Stalin, representing the opening salvos of the Cold War. The selection of the cities to be bombed was also more akin to a scientific experiment, rather than a purely strategic military calculation. The nominated cities had thus far been left deliberately untouched during the regular nightly bombing raids, in order to accurately assess the full capacity and damage inflicted by the atomic bombs. The decision to use the bombs was also predicated on racist and dehumanising attitudes towards the Japanese. The Japanese were frequently depicted as “yellow vermin”, “living snarling rats” or “monkeys”. Indeed, the dehumanisation was such that the mutilation of Japanese soldiers became widespread. US servicemen frequently removed ears, teeth and skulls as grisly war trophies. Even President Roosevelt was infamously sent a letter opener carved from a Japanese bone by a US congressman. It was easier to drop inhumane weapons on those who were not really human to begin with. But perhaps the greatest condemnation of the bombings is that they were unnecessary on the eve of the inevitable Allied victory, as the 1946 United States Strategic Bombing Survey later concluded. The Japanese were militarily exhausted and on the verge of defeat at this stage. In addition to staggering casualty figures, and extensive devastation of infrastructure through the aerial bombardment and firebombing campaigns, the naval blockade codenamed Operation starvation had also completely crippled the wartime economy. Yes, unconditional surrender was publicly rejected by Japan’s leaders. However, privately, they were also making desperate entreaties to the then neutral Soviet Union, to mediate peace on more favourable terms. The Japanese would also have been keenly aware that the collapse of Nazi Germany had worrying implications for the redeployment of Allied forces. The “betrayal” by the Soviets, who declared war on Japan on 9 August, just before Nagasaki was bombed, was the final straw. The Soviet army quickly defeated the Japanese in Chinese Manchukuo, crushing any vestige of hope that Japan might survive the conflict intact. Surely 70 years is long enough for us to put to rest the tired canard of the lesser of the two evils, and recognise the true gravity of this crime against humanity. Dr Akil N. Awan is associate professor in Modern History, Political Violence and Terrorism at Royal Holloway, University of London. He is on Twitter @Akil_N_Awan. Republished from The New Statesman with the author’s permission.